” President Donald Trump’s Week 12 in Office – April 10-14, 2017 – A contrarious View of His Governance Model ” – April 14, 2017. 1. New York Times wins three Pulitzer prizes : (a) Breaking News photography for Daniel Berehulak – for providing a portrait of a violent campaign in Philippines; (b) Feature writing for CJ Chives for his piece on a young veteran of the War in Afghanistan suffering from PTSD; and (c) International Reporting for the series on Russia’s surreptitious assertion of power. Public service award goes to Daily News for a series on New York Police Department’s widespread abuse of decades old laws to force people from their homes and businesses over alleged illegal activity. 2. A Federal Judge struck down Texas’s 2011 Voter Identification Law, ruling that it was enacted with the intent to discriminate against black and Hispanic voters. 3. President Donald Trump’s proposed cuts in Environmental Programs will affect Clean Water, Pollution Control, and Law Enforcement – prevailing general feeling. Former President George Bush favors foreign aid. Cuts on US spending abroad is not the right move according to him. 4. Meeting aggressive sales goals by creating fraudulent accounts scandal consumed two more executives of Wells Fargo – John G Stumpf, former Chief Executive, and Carrie L Tolstedt, former Head of Community Banking – who have been commanded to pay $ 75 million in compensation. The conditions and culture prompting this scandal were detailed in a 113 page report after six months of investigations. 5. Education Secretary, Betsy DeVos has withdrawn several memos regarding Consumer Protections for Student Loan borrowers issued under the previous administration. High quality customer service plus accountability and transparency for all borrowers plus limiting costs to taxpayers are the key intents. 6. President Donald Trump passed his First Test of his reign/administration when Republican Ron Estes won the Kansas Congressional seat, albeit a narrow margin, vacated by Mike Pompeo, presently the CIA Director. 8. The first meeting between President Donald Trump’s top official, Secretary of State, and Russian President took place on Wednesday. This came in the wake of the Russian cover up in Syria Chemical attack, an accusation the WH understandingly held. 9. President Donald Trump’s wow to revise the tax code has been viewed with apprehension/fear by the Democrats presenting the President’s Conflict of Interest threadbare even as the President has been unwilling to overhaul deductions he has used to avoid paying taxes. 10. President Donald Trump’s Mar-a-lago, Florida, slapped with 13 health violations, three of them categorized as “high priority”. 11. President Donald Trump signs anti Planned Parenthood law. 12. US dropped the most potent non-nuclear bomb (21600 kg) in East Afghanistan close to Pakistan border to destroy the ISIS strongholds in the region, tunnels, and bunkers on Thursday. President Donald Trump seems to be amenable to changes in his positions adopted with strong feelings during the Election Campaign : 1. From NATO being ‘obsolete’ to NATO is ‘no longer obsolete’. 2. From ‘China being currency manipulators and perpetrators of trade losses’ to ‘China is no longer the currency manipulator, and President Xi Jinping is sincere in helping defuse the US showdown with North Korea’. 3. From ‘Our relationship with Russia is beneficial’ to ‘We may be at an all-time low in terms of our relationship with Russia’ now. Rather than criticising these as flip-flops, the President’s views above shall be taken to reflect prudence and diplomacy in the face of combatant challenges – a stand also indicative of the deep learning initiative he is able to bring to his character and temperament that his critics have been contesting forcibly until now. 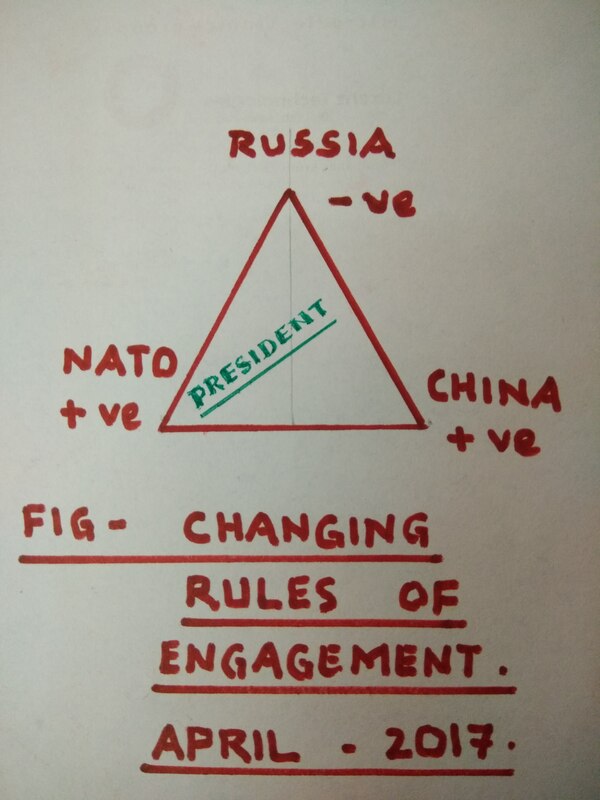 People’s psychological changes and reflections to any action(s) of the leader are so fast changing and uncertain mimicking the swinging movements of a metronome that what works or perceived to be working in the ‘present’ cannot be guaranteed even for short durations in the political horizon of this new age. Changing views is an inescapable requirement of making for the objectives in a situation as it exists now globally. Just as in business to repair the damage caused to a company is much more than just a tall order (say, for example : as with disgruntled customers), in Politics to redeem the positive perceptions once lost is more than just humongous. If the President does not move ahead consistently, it would mean he has either stopped or the hurdles in course have worked successfully. But, he is moving ahead consistently by “tweaking and shifting his stance on issues” as above with determined assertion and aggression. It is also significant to note that the President is still in the introductory stage of Governance ( you only have to draw a parallel to the concept of Marketing PLC to understand this). Time is the essence and immediate pronouncements for or against may not be appropriate. 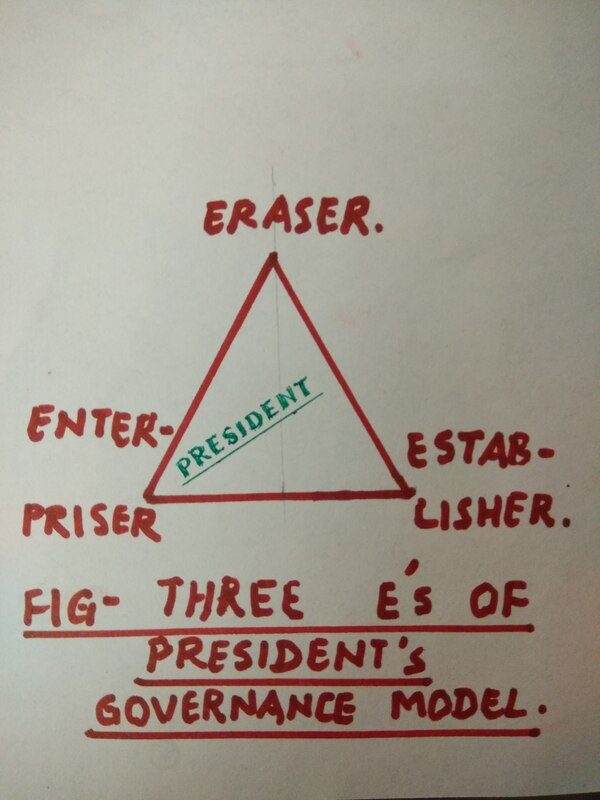 President Donald Trump has astutely incorporated the three following elements in his model of Governance :” Eraser, Establisher, and Enterpriser “. (a) Eraser : Eraser tries to erase some memories, programs, schemes, plans, or even thoughts prevalent among people. First, President Donald Trump took the mood, emotions, faith, beliefs, and changing attitudes of people to harness and sustain the loyalty and following to his `brand’ of administration. Second, he identified “Growth & Jobs”, “Immigration Control & Stability”, and “Safety & Security” of people as the three pillars of his population market segment to focus on. In the process he forged ahead with undoing and redoing some programs of the earlier government(s). Some like it, some do not. “My mode of operation is different and I’ll not hesitate to be flexible” – is possibly what the President attempts to convey to people. This is how the “Eraser” that President Donald Trump is, perhaps, wants to move ahead and recognized. (b) Establisher : Establisher tries to establish, fix, Institute, or even educate people to hold power and position. To put his ideas to work and fruition, President Donald Trump needs to muster partnerships to manage and sustain internal/external resistances to a minimum. 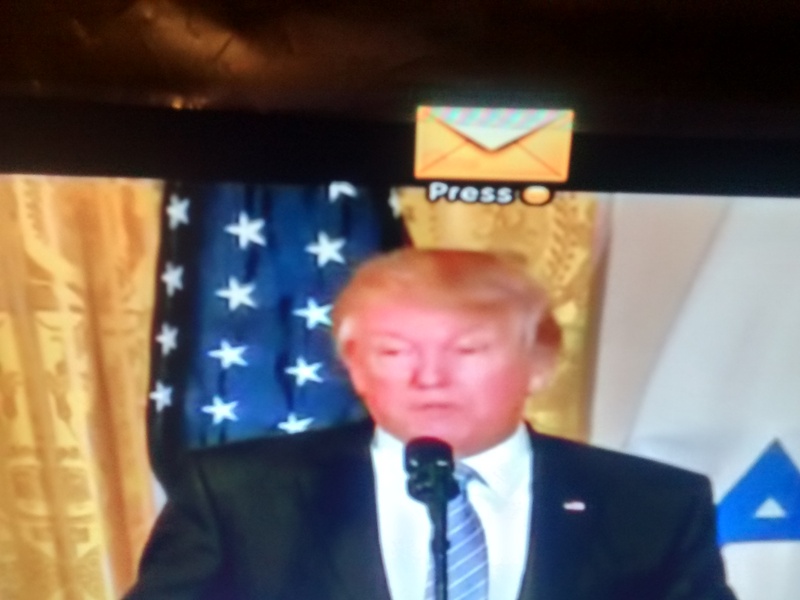 If President Donald Trump’s views on Russia, after the deadly Chemical Weapons Attack in Syria; on Syria, his harsh words that Bashar-al-Assad’s actions should not go unpunished with Secretary of state, and the US representative of the UN Assembly echoing similar views openly; on China, the somewhat unexpected camaraderie displayed with the Chinese President Xi Jinping last week; on Germany, his congratulations on phone to the Chancellor Angela Merkel on her local elections victory coming close on the heels of the well critiqued indifference to shake hands courteously when they met in WH – all signaling significantly deep departures from his election campaign views, but a portend to his possible shift in foreign policy initiatives strategically valued to arrest tensions. This possibly is how the President, the “Establisher” that he is, wants to dig his heels in. (c) Enterpriser : Enterpriser tries to initiate, develop, risk, build, or even excite and embolden people, policies, institutions, and the nation(s). As is his wont, President Donald Trump has been daring and adventurous in his decisions – Spontaneous attack on Syria; Cutting funds/foreign aid for some sectors in the budget; Attempting to repeal and replace ACA; Going forward with new designs and preliminary work on building the Wall in the Southern border are some in this context. He is possibly engaging in pilot Market Research to gauge the reactions of people, analysts, and critics. It is perfectly in order up to a point at this juncture. What is, however, crucial will be the ensuing actions in the nature of Kanban/Kaiser – incremental improvements to all of the above programs even as they progress. This possibly is how the President, the “Enterpriser” that he is, charts his course of accomplishments. In conclusion : What possibly can impact seriously his effectiveness is his words perceived by many as rudish, more than his deeds getting attacked openly in these uncertain circumstances. This weakness has the potential to affect the spirit and morale of his own associates besides impacting the work in progress. Cautious optimism will be the watchword. If that be his goal, his acts have to be viewed with thought; he should be given adequate time for future corrections; his programs monitored closely before passing any verdict prematurely. Meaningful improvements in the lives of people may not be visible still. It is only 12 weeks now, and he has still a lot of time to redeem and redintegrate. Can people hope for a magic bullet work?